Family friendly. Wifi enabled. Free parking. 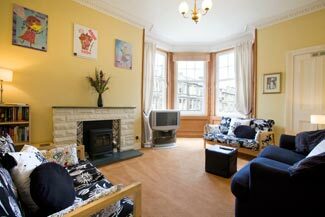 This apartment is on the second floor (reached by common stairs) of a Victorian tenement building about 15 minutes walk east of Princes Street. You can see its windows on the corner in the middle of the photograph (right). 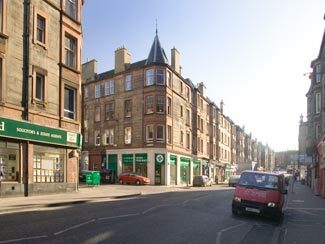 10 minute's walk will take you to the Omni cinema complex, Jongleurs Comedy Club and Valvona and Crolla Italian delicatessen and restaurant on Leith Walk , and in the other direction there's a big supermarket, though there are smaller shops all around for your provisions. Regular buses ply along London Road about a hundred yards away. Holyrood Palace and the start of the Royal Mile which leads to Edinburgh Castle are a 10 minute walk. 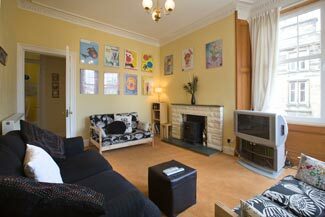 Owners Julie and Stephen Reynolds welcome friends and families to stay on a self-catering rental basis, and have arranged the flat so it has a cot (crib), high chair and childrens' games, and can provide baby-sitting by prior arrangement. A great bonus is that there is free parking in the streets around about. Two views of the Sitting Room with large corner windows, armchairs, sofa (sofa bed), cable with television with Xbox console and selection of games and DVDs. Wi-Fi broadband is available throughout the flat for laptops. 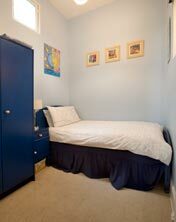 Twin bedroom (or family room with extra bed). 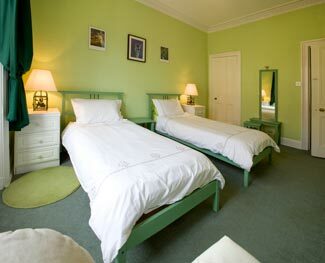 Double bedroom (with hair dryer). There is payphone in the Hall. The Kitchen. The dining table is in the alcove at the far end. "Edinburgh was great. 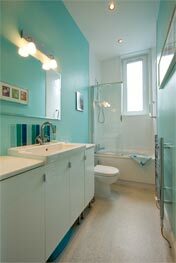 The flat was terrific - perfect for our family. Thank you for your hospitality." Pickering family, Oastburg, Wl, USA. 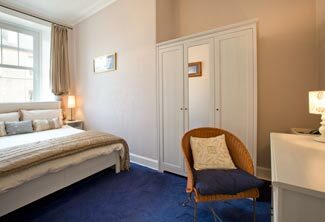 Gas and electricity, wi-fi, bed linen and towels included in the rental price. 20% deposit secures your reservation, the balance due 4 weeks before your arrival. Credit card payments incur a 4% booking charge. Cancellation charges apply, please enquire. Arrival time is after 2pm, departure before 12am. 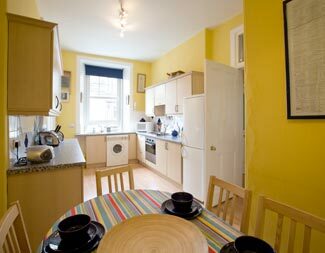 6th and 7th guests can be accommodated - please enquire. 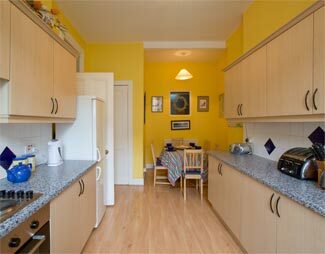 View of the kitchen from the dining table. "We are members of the 'Arts Welcome' scheme approved by the Edinburgh & Lothians Tourist Board to cater for the needs of cultural tourists. On arrival at the apartment, we will show you around, explain how things work and answer any questions you may have on making the most of your visit." Please tell Julie and Stephen you found 2 Rossie Place through About Scotland!